My first look features a fall staple - the boxy long coat in camel or beige, available from My Spirit Inc. This structured coat is perfect to throw on as it goes well with anything and is great for layering inside with denim on denim or chunky knit sweaters paired with shirts. The coat maintains its boxy cut as it's made of quality cotton polyester blend and channels urban chic. I imagine this is what I would be wearing (with tights and boots) overseas and walking along the streets of London. I really like this jacket for its motorcycle design, gold zippers and structured power shoulder. But what I really love is that the sleeves features tweed interlaced with gold and multi-colored threads, making this a statement piece. It is fittingly tailored and just skims the hip, and is therefore great for pairing with skirts or skinny jeans. I believe winter clothing should be colorful and fun as well, on top of serving their purpose of keeping us warm. I always love a good, tailored blazer because I believe that it will elevate any look from shabby to chic. This navy contrast lapel blazer fits right into my closet as it goes well with tailored shorts, tweed shorts or fitted wide trousers. The lapels come with a silk stitching on its underbelly, and can be folded to create a slightly different look. Paired here with a simple shirt and shorts ensemble, this look is good enough to hit the town in. I'd even wear it just to run errands! Besides all these fall season appropriate outerwear, My Spirit Inc also offers elegant and feminine apparel fit for Singapore's warm weather. All their clothes are imported straight for Korea, and of really good quality. 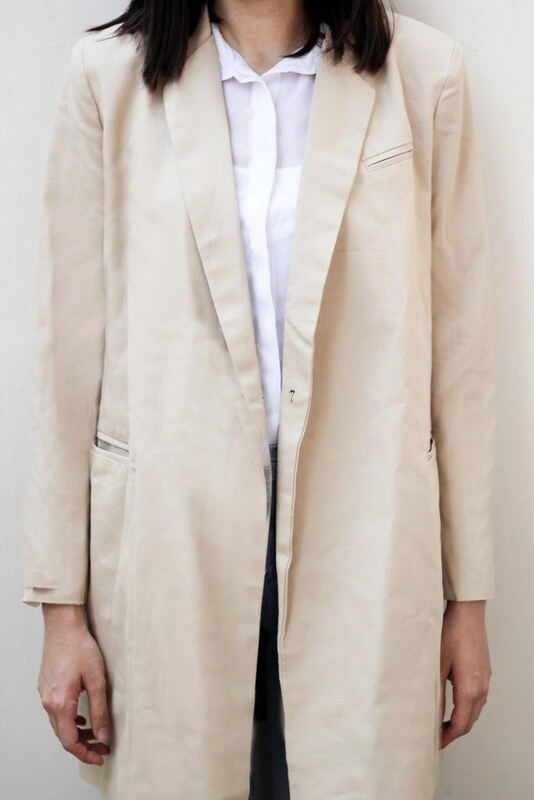 I have always had the impression that Korean ladies really know how to dress for the office and for off hours in a very feminine, elegant and ladylike manner, and their aesthetic would look really good with some slight European masculinity thrown in (keys in men's outerwear, ripped boyfriend jeans, wide-legged tailored trousers). I am also a sucker for their shoe selection here - with sweet maryjanes, suede slippers with stitched on motifs, badass boots and cat motif highcut sneakers - definitely something for every girl's wardrobe and at a much friendlier price than those seen at Topshop or other high street brands! Cecilia, the founder of My Spirit Inc, regularly brings in new pieces from Korea to update the selection. I find that her curation represents the latest trends of Korean fashion - all very wearable, yet adds an edge to an otherwise ordinary outfit. Please do check out My Spirit Inc for quality Korean fashion, conversation starting statement shoes, or just the next time you're traveling overseas to somewhere cold!